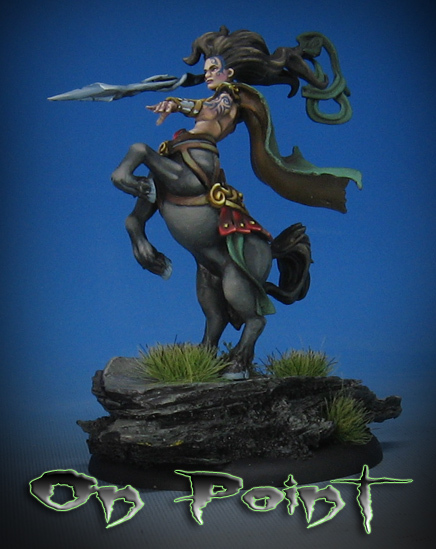 This figure from Cadwallion Miniatures was an interesting subject. It seemed to be sculpted in ZBrush, and cast in resin. This is one of a few recent figures that I have done from this line, which apparently is a spin off from Rackham/Confrontation. As with most of the pieces I have done lately, the first 50-60% was done with oil paints, and then the rest finished off with acrylics. The oils allow me to work on many more figures at the same time, in particular figures that have similar color schemes. Since the fantasy and historical pieces all have the same kinds of earth tones and greens, this is very handy! !